This nice vintage set of gold tone mesh earrings with matching v collar necklace has the original box and tag. Made by "Evening Mesh" and has a lifetime guarantee. It shimmers with the slightest movement and catches every light. Earrings are clips,and hang 2 1/4". 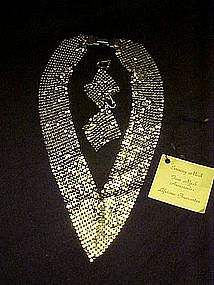 Necklace unclasped measures 19" long. Nice clasp fastener. This set looks like brand new and is like the Whiting Davis ones, but not. Pristine condition! !